In this study the commissioning of a dose calculation algorithm in a currently used treatment planning system was performed and the calculation accuracy of two available methods in the treatment planning system i.e., collapsed cone convolution (CCC) and equivalent tissue air ratio (ETAR) was verified in tissue heterogeneities. For this purpose an inhomogeneous phantom (IMRT thorax phantom) was used and dose curves obtained by the TPS (treatment planning system) were compared with experimental measurements and Monte Carlo (MCNP code) simulation. 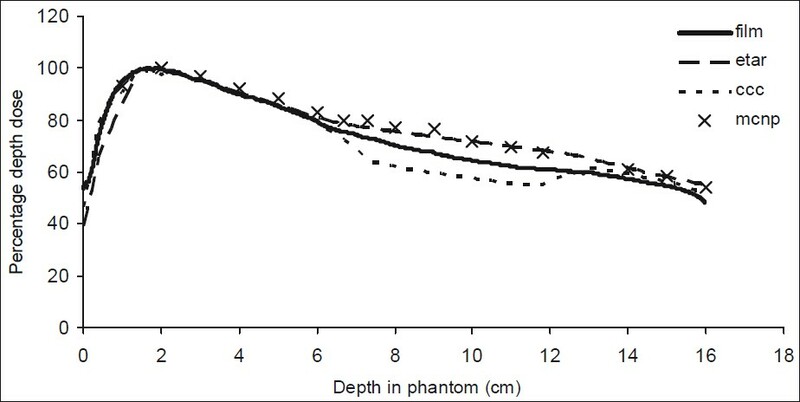 Dose measurements were performed by using EDR2 radiographic films within the phantom. Dose difference (DD) between experimental results and two calculation methods was obtained. Results indicate maximum difference of 12% in the lung and 3% in the bone tissue of the phantom between two methods and the CCC algorithm shows more accurate depth dose curves in tissue heterogeneities. Simulation results show the accurate dose estimation by MCNP4C in soft tissue region of the phantom and also better results than ETAR method in bone and lung tissues. Direct measurement of the 3D dose distributions within the patient is not possible. Each calculation method which can improve the accuracy of dose distribution prediction, even slightly, will be significant. One of the major sources of uncertainty in patients absorbed dose determination is the method of dose calculation , and approximations used in inhomogeneity correction. Therefore, various commercial treatment planning systems allow utilizing multiple algorithms (with their own advantages or disadvantages) in dose calculation process. So for clinical implementation, verification of treatment planning system and implemented dose calculation algorithms must be done in various clinical situations especially in discrepancy regions. The currently used treatment planning system (CorePLAN) (Seoul C and J Inc.) software used in this study is a recently developed treatment planning system that uses two methods of dose distribution calculations within the patient; the correction based equivalent tissue-air ratio (ETAR) method and the collapse cone convolution algorithm. The purpose of present study is the initial examination of the accuracy of dose calculations in heterogeneous phantom performed by the collapse cone convolution algorithm available in this commercial TPS after its commissioning. 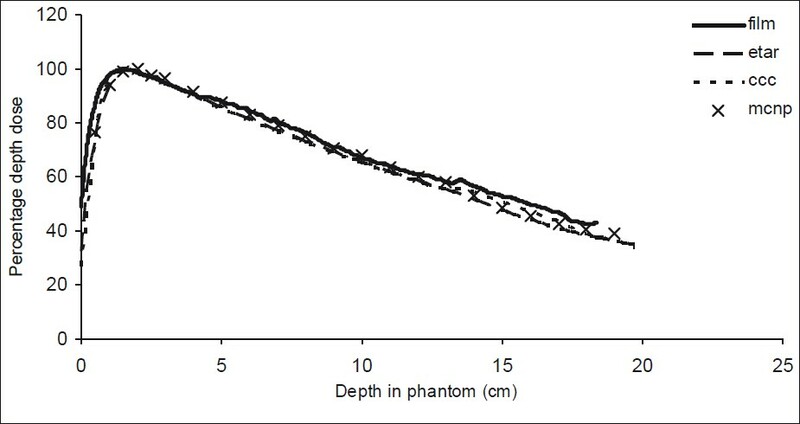 In the first step, all dosimetric data of a Varian 2100 C/D linear accelerator that measured by water phantom (PTW Inc, MP2 model) including percentage depth dose and beam profile curves (of 3 depths) relevant to different field sizes (min 3 × 3 cm 2 and max 40 × 40 cm 2 ) were entered to treatment planning system. Other data, i.e. output factor, calibration setup, and convolution parameters were inserted too. Since the CCC algorithm unlike measurement-based algorithms does not utilize measured data directly, the beam modeling process should be performed to obtain the parameters which are considered as photon beam physical description. Because of more accuracy, beam modeling can be performed for various field sizes and various beam modifiers. In this research, beam modeling was performed for two energies: 6 and 18 MV, and there are five groups of models including open field and four 15, 30, 45, and 60° wedged fields for each energy. After beam modeling process, the PDD curves for 6 MV photon beam resulted from CCC calculations with measured data for open and 15, 30, 45, and 60° wedged, 5 × 5 and 10 × 10 cm 2 fields were compared as a preliminary check for confidence about the accuracy of performed modeling process. Because of uncertainty in build up region, all comparisons were done after build up depth. 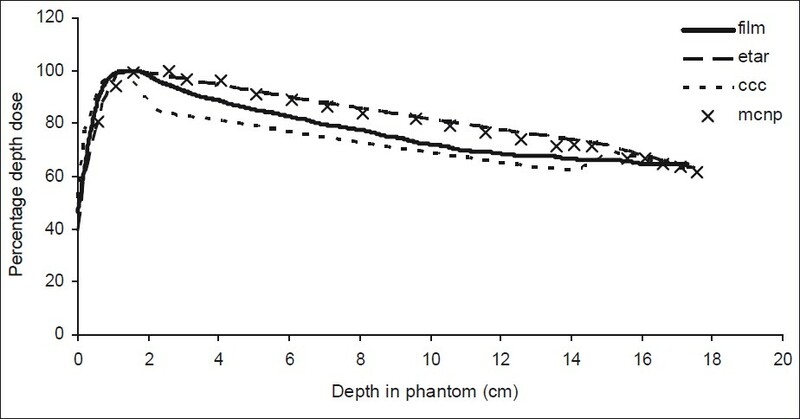 Among all fields, maximum dose difference (DD) between measured and CCC calculated depth dose curves occurs for the 60° wedged 10 × 10 cm field at deepest points in the phantom (18, 19 cm depths), which is -3.4% and is similar to the ETAR method [Figure 1]. Verification of the two dose calculation algorithms in heterogeneous situation was done by IMRT thorax phantom (CIRS Inc, model 002 LFC). It is an elliptical inhomogeneous phantom that has 30 cm length, 30 cm width, and 20 cm thickness at middle and includes soft tissue, bone (1.6 g/cm 3 ), and lung (0.21 g/cm 3 ) equivalent materials. It has provision to do measurement at different points with different dosimeters (such as ion chamber, film, TLDs, MOSFET, and diodes). CT scan of phantom was performed on Siemens sensation 16 CT scanner with slice thickness of 1 mm. Phantom CT data were transported to the TPS and dose calculations for treatment plans performed by ETAR and CCC engines. Treatment plans contained 10 × 10 cm 2 fields covering mediastinum and lung and a 17 × 6 cm 2 common wedged field covering breast region of the phantom. The MCNP4C Monte Carlo code was used to model the particles transport through the phantom because of its ability to simulate the 3D geometries and calculate the fluence or absorbed dose on each surface or cell. Usually Linac simulation is performed in two steps including electron source definition at the top of the target and using the produced X-ray spectrum in order to photon source description. Due to inaccessibility to detailed specifications of the accelerator's head, the simulated spectrum for 6 MV Varian 2100 Linac by the BEAMnrc code  was used. Of course the spectrum was adapted with the present machine by fitting the measured and calculated PDD curves in water phantom via moving forward the maximum energy in the spectrum and a point source was defined finally. 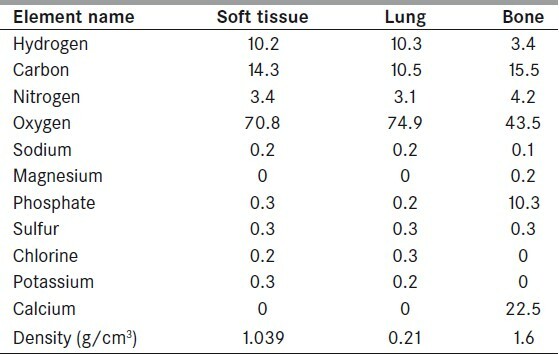 The irregular lungs shape was constructed by several straight and bent surfaces to create the most similarity with actual shape of phantom lung cross section [Figure 2] and the tissue equivalent compositions for lung, bone, and soft tissue derived from ICRU report 44, with the actual phantom densities were used in simulation [Table 1]. Cylindrical cells of detector were defined in appropriate directions for obtaining relative depth doses [Figure 3] and input files were ran with more than 10 9 particles to gain acceptable statistical uncertainty (less than 1%). Transport cut-off was changed to decrease MC calculation time. The cut off energy for photon and electron were 0.01 and 0.5 MeV, respectively. In order to compare dose distribution results in various regions of the phantom, EDR2 Kodak radiographic film was considered. Film calibration was performed by exposing specific doses in the range of 0 to 200 cGy to the film placed at 5 cm depth within the Perspex layered phantom. Calibration curves were made by means of optical densities resulted from film development and scanning by a transmission scanner (Microtek model 9800XL). The ImageJ software was used for process of scanned images and extraction experimental data. After film placement inside the phantom, determined treatment set-ups were irradiated and films development was performed in the same condition (developer material and scanner settings) with calibration films. However conditions in development and process for all film were tried to be the same, but a little uncertainty in results is unavoidable. To evaluate algorithms results within the patients' bodies (specially lungs effects), seven random breast cancer plans were calculated by two available algorithms and dose-volume histograms (DVHs) were created using CorePLAN planning system for each patient and also dosimetric parameters including minimum, maximum, and mean doses dependent to planning target volumes (PTVs) and organs at risk (OARs: lungs in breast cases) with prescribed doses were registered. Then mean relative differences (%) for Dmin , Dmax , and Dmean parameters that had been calculated by CCC and ETAR methods were calculated via equation 1 for all PTVs and OARs. To investigate algorithms success in giving prescribed dose to planning target volume and determine the preferred method for dose calculations in thorax region, the difference between calculated dose (by each method) for each point of PTV and prescribed dose should be obtained and then average difference for all points should be calculated. Therefore, the difference between Dmean presented by the software and the prescribed dose can be calculated by Equation 2. [Figure 4] shows the dose distribution within the thorax phantom calculated by the collapsed cone convolution (CCC) algorithm in comparison to ETAR result. The differences in the field edges are clear and there is a dramatic disagreement in bottom of the phantom (15.5 cm depth), where the lungs and bone tissues are appeared in the sides and central region of the field. The beam profile curve for the discussed region (on the line passing through the center of the bone tissue) is a good example for showing the differences between algorithms and can clarify the object. [Figure 5] shows that dose is underestimated within the bone by both algorithms, whereas the DD for CCC algorithm is lower than the ETAR respective value. By moving from the central axis, three profile curves are approached together at the end of the bone tissue. The ETAR related DD is increased in the field edges while entering the lungs. Dose is underestimated by the CCC algorithm within the lungs such as the bone case in this plan. The measured PDD data have been plotted against results of Monte Carlo simulation and TPS calculations by two available methods in [Figure 6], [Figure 7] and [Figure 8] and all curves have been normalized to their maximum dose. Schematic view of three arrangements made by MCNP4C code has been indicated in [Figure 3]. The depth dose distribution results can be studied in soft tissue, bone, and lung regions, also for entrance and exit surfaces to heterogeneities. [Figure 6], [Figure 7] and [Figure 8] confirm that the CCC algorithm underestimates the dose in both lung and bone tissues, but it is obviously more accurate than the ETAR algorithm in heterogeneities. It can be seen in [Figure 6] that algorithms show the same results in soft tissue equivalent materials of the phantom before approaching to the bone, as both algorithms underestimate the dose in this region. Inversely the Monte Carlo simulation has good results in soft tissue and indicates significant variance in lung and bone tissues. The CCC algorithm is more inaccurate in entrance interfaces and more accurate in the points of exit from lung [Figure 7] and [Figure 8]. Curves that compare the DD percent between two methods in the TPS, which have been shown in [Figure 9] and [Figure 10] for plans 2 and 3 [Figure 3]b and c, can simplify the verification. It is observed in [Figure 9] that the result differences is increased between 13.5 to 17.5 cm depths within the bone, as the CCC algorithm shows DD in the range of -1.5 to -3.5%, whereas DD is between -3.5 and -6% for the ETAR method. DD in lung tissue is lower than 5% in depths more than 6 cm for the CCC case and between 5 to 10% for ETAR case in points deeper than 3 cm [Figure 10]. 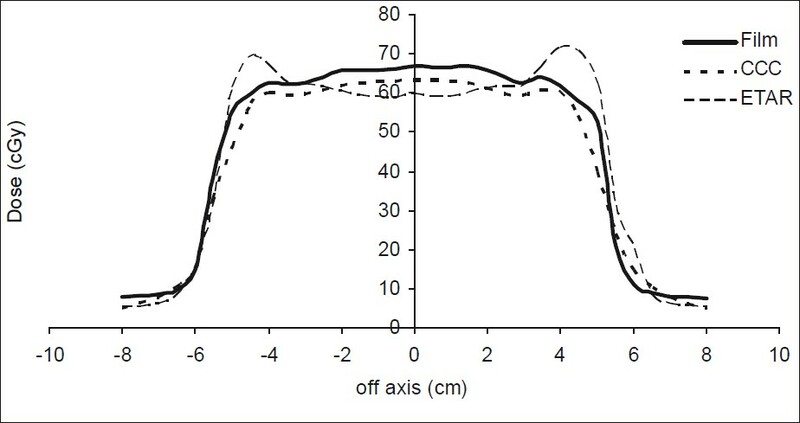 Observed fluctuations on DD curves from 4 to 12 cm depths [Figure 9] are resulted from lungs hiding and further appearance inside the field. This occurs in 4-8 and 8-12 cm depths respectively, because of the increase and decrease in scattered photons due to replacement of the lungs with soft tissue and vice versa. [Table 2] and [Table 3] indicate the results of the statistical comparisons [Table 2] and [Table 3] have calculated by Equation 1, and [Table 4] has calculated by Equation 2]. Minus shows the dose values underestimation by the CCC algorithm in relation to the ETAR algorithm. The average difference between calculated mean doses by two methods was 2.4% for target volume and 9.3% for lung, in selected plans. This intense variation for lung is explained by presented results in thorax phantom [Figure 7], [Figure 8] and [Figure 10] and some previous papers. , Difference between prescribed dose for all cases and calculated dose by ETAR and CCC methods has tabulated in [Table 4]. As it can be seen, CCC has better results in all cases excepting cases 2 and 4 which have less calculated Dmean [Table 2] in relation to ETAR method. The scattered dose considerations are mainly responsible for the significant differences between algorithms in various mediums. The accuracy of dose calculations in studied TPS was better than 3.4% in homogeneous phantom and homogeneous parts of thorax phantom and both the ETAR and CCC methods showed similar ability for modeling such situations. Entering tissue heterogeneities especially lung, displays intense differences between calculation methods and kernel-based models show their preferences. This study shows the excellence of the CCC algorithm in relation to ETAR method for dose calculations within the tissue heterogeneities. Comparison of the calculated percentage depth doses by the TPS indicates that there is a maximum 0.5% difference between results of CCC and ETAR methods in soft tissue and both are in the acceptance criteria range presented by Venselaar et al.,  but there is a difference about 3% in bone and 12% in lung tissues between methods. Calculation methods implemented on CorePlan has not been compared before in this TPS, but B. Juste et al. notified maximum 5% overestimation between Clarkson-based algorithm and measured depth dose in the low density media (0.0311 g/cm 3 ) for 6 MV photon beam and 10 × 10 cm 2 open field, which was obtained maximum 10% in this work [Figure 7] and [Figure 10]. Intense differences in point dose calculation are observed in TPSs which use Clarkson or ETAR method in Eduard Gershkevitsh et al. work. This reference also indicates that CCC algorithm underestimate the point doses maximum 4-5% in most complex test situations which is compatible with our results [Figure 6], [Figure 7], [Figure 8], [Figure 9] and [Figure 10]. 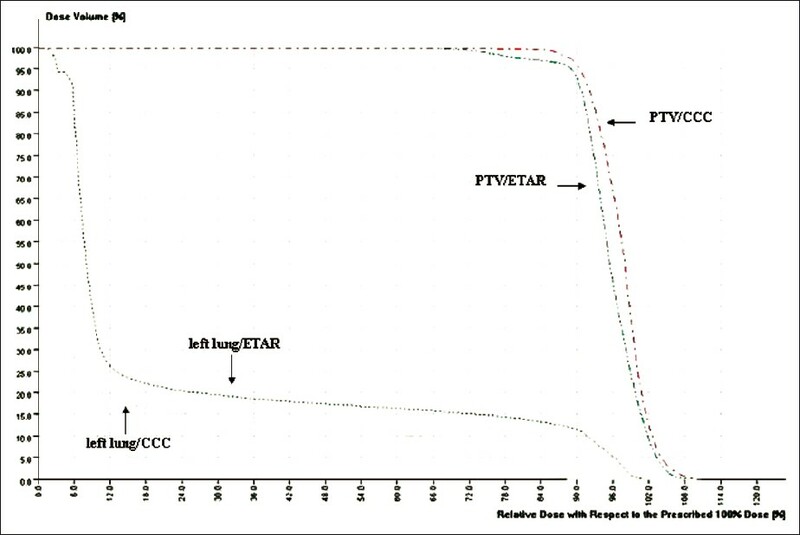 Investigation of DVH curves created by CCC and ETAR calculations confirmed the results obtained in thorax phantom. The Monte Carlo simulation results obtained in this work confirm the important role of the accurate quantification for the elemental structure used in MCNP material specification card, and results show the incoherence of the ICRU Report 44 compositions with actual IMRT thorax phantom specifications. The beam modeling process performed in the commissioning stage in this research was experienced by comparing with the water phantom PDD results. It may be possible to attain the more accuracy results for CCC algorithm by optimizing advanced modeling parameters and beam modeling process. Similar studies can be performed for other inhomogeneous phantoms such as pelvis or head for attaining knowledge about dose calculation quality of CCC algorithm in different situations. The authors wish to thank medical physicists and personnel of radiotherapy department at Pars Hospital Tehran, Iran, and Peyvand-e-Sabz Company for their close cooperation in this project. 1. Ahnesjö A, Aspradakis MM. Dose calculations for external photon beams in radiotherapy. Phys Med Biol 1999;44:R99-155. 2. Gershkevitsh E, Schmidt R, Velez G, Miller D, Korf E, Yip F, et al. Dosimetric verification of radiotherapy treatment planning systems: Results of IAEA pilot study. Radiother Oncol 2009;89:338-46. 3. Ahnesjö A. Collapse cone convolution of radiant energy for photon dose calculation in heterogeneous media. Med Phys 1989;16;4:577- 592. 4. Aspradakis MM, Morrison RH, Richmond ND, Steele A. Experimental verification of convolution/superposition photon dose calculations for radiotherapy treatment planning. Phys Med Biol 2003;48:2873- 93. 5. Hansen AT, Petersen JB, Høyer M, Christensen JJ. Comparison of two dose calculation methods applied to extracranial stereotactic radiotherapy treatment planning. Radiother Oncol 2005;77:96-8. 6. Lax I, Panettieri V, Wennberg B, Duch MA, Näslund I, Baumann P, et al. Dose distributions in SBRT of lung tumors: Comparison between two different treatment planning algorithms and Monte-Carlo simulation including breathing motions. Acta Oncol 2006;45:978-88. 7. Hasenbalg F, Neuenschwander H, Mini R, Born EJ. Collapsed cone convolution and analytical anisotropic algorithm dose calculations compared to VMC++ Monte Carlo simulations in clinical cases. Phys Med Biol 2007;52:3679-91. 8. Sheikh-Bagheri D, Rogers DW. Monte Carlo calculation of nine megavoltage photon beam spectra using the BEAM code. Med Phys 2002;29:391-402. 9. International Commission on Radiological Units and Measurements (ICRU), International Commission on radiation units and measurements, Report 44, Tissue Substitutes in Radiation Dosimetry and Measurement. International Commission on radiation units and measurements, The University of Michigan 1989. 10. Muralidhar KR, Murthy NP, Raju AK, Sresty NV. Comparative study of convolution, superposition, and fast superposition algorithms in conventional radiotherapy, three-dimentional conformal radiotherapy, and intensity modulated radiotherapy techniques for various sites, done on CMS XIO planning system. J Med Phys 2009;34:12-22. 11. Knöös T, Wieslander E, Cozzi L, Brink C, Fogliata A, Albers D, et al. Comparison of dose calculation algorithms for treatment planning in external photon beam therapy for clinical situations. Phys Med Biol 2006;51:5785-807. 12. Nisbet A, Beange I, Vollmar H-S, Irvine C, Morgan A, Thwaites D. Dosimetric verification of a commercial collapsed cone algorithm in simulated clinical situations. Radiother Oncol 2004;73:79-88. 13. AAPM Report 85. Tissue inhomogeneity corrections for megavoltage photon beams, Technical report. Published for the American Association of Physicists in Medicine by Medical Physics Publishing at Madison; 2004. 14. Venselaar J, Welleweerd H, Mijnheer B. Tolerances for the accuracy of photon beam dose calculations of treatment planning systems. Radiother Oncol 2001;60:191-201. 15. Juste B, Miró R, Campayo JM, Díez S, Verdú G. Comparison of experimental 3D dose curves in a heterogeneous phantom with results obtained by MCNP5 simulation and those extracted from a commercial treatment planning system. Appl Radiat Isot 2010;68:913-7. Molazadeh, M. and Saberi, H. and Rahmatnezhad, L. and Molani, A. and Jabbari, N.